With the summer solstice in June, there is more daylight for gardening than in any other month. Garden tasks include planting, weeding, and, if rain is scarce, watering recently planted woody plants. It’s a great time for visiting other gardens as well as observing flowers, birds, and insects in your own. 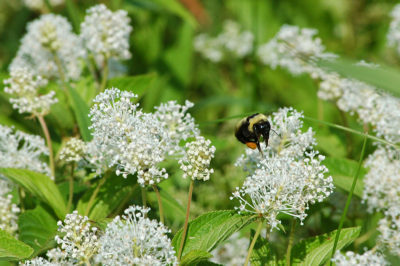 Pollinator Partnership has designated June 18–24 as Pollinator Week. Their projects and extensive resources include planting guides and plant selection app, curriculum materials, and fact sheets about gardening practices that protect and support pollinators. 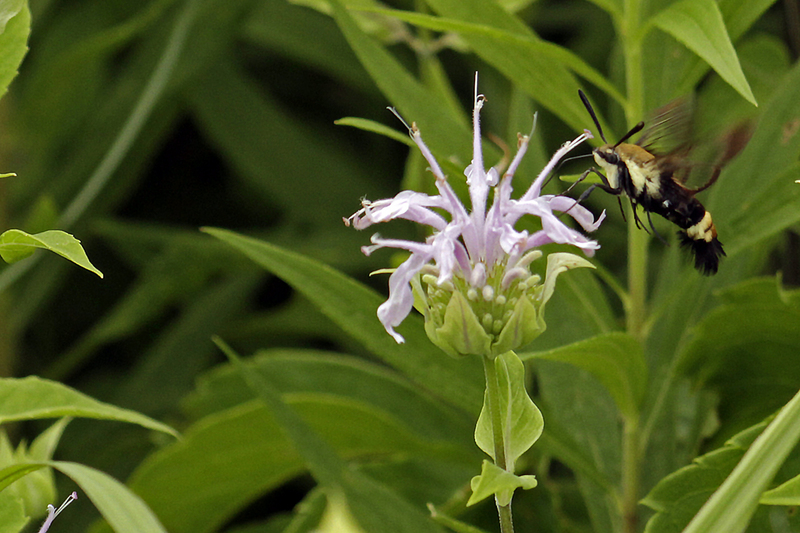 Many diverse insect pollinators visit June-blooming native plants suitable for our area. Each example below is but one story of the many connections between species in summer gardens. For each, I include a resource for identification or life history information, as well as web portals to share your observations. New Jersey Tea (Ceanothus americanus), in the buckthorn family, is somewhat woody. It grows 2–3 feet tall with spreading branches and clustered tiny lightly-scented white flowers. It grows well in dry to mesic loam, sandy, or rocky soils, in light shade or full sun. It survives drought and may bloom over a month’s time, attracting solitary bees, bumble bees, wasps, and flies. It is the host for caterpillars of spring and summer azures (Celestrina ladon and C. neglecta) as well as a nectar source for adults. See Butterflies and Moths of North America and Wisconsin Butterflies for identification and mapping tools. Anise hyssop (Agastache foeniculum) can reach a height of 3 feet, growing well in dry or mesic soils, in partial shade or sun. A member of the mint family, its leaves are strongly scented but the flowers are not. The small flowers are held in long-flowering spikes. They attract small and large bees, including specialist species, and syrphid flies, bee flies, butterflies, and moths. Examples of moth visitors include the yellow-collared scape moth (Cisseps fulvicollis) and snowberry clearwing (Hemaris diffinis). Using Bug Guide, you can submit photos for identification. During this month, Wisconsin milkweeds are in leaf and monarchs seek them out as larval hosts. As milkweeds come into bloom, their many insect visitors include butterflies, moths, beetles, ants, and bees. Later in the season, you can collect seed for plantings in new areas. Monarch Joint Venture is an umbrella organization for all things monarch; the Monarch Larval Monitoring Project has monitoring protocols and data portals. Submit your migration observations on Journey North, a web resource for biology and population information and migration maps. For gardeners, the Xerces Society book Gardening for Butterflies includes plants and practices for monarchs and other lepidopteran species. The new Wisconsin bumble bee monitoring project, Bumble Bee Brigade, went live last month. Visit their site to learn more about training opportunities and submit your Wisconsin bumble bee observations and photos. By growing native plants, making your own garden observations, and using these portals to contribute data, you can support pollinator, plant, and land health this month and throughout the season.